Wow! We’re Not Alone in Seeing Comcast as a Bully! London I hit the ground in London around noon their time. Ok, that overstates it. After flying overnight from Houston, it would be more accurate to say that I stumbled out of the plane like the rest of my flying comrades to an overcast and raining day, totally different than the weather I had convinced myself that I would find. Two hours later I was in a Starbucks waiting for the ACORN London organizers and their volunteers on the doorknocking push before their first meeting. And, here’s where it got good! The esteemed and influential media columnist for the New York Times, came out powerfully with our position that Comcast had finally showed its true self as a bully extraordinaire. Better, Carr argued, as we had, that this will encourage the FCC to look at them more closely. As the old saying goes, “hubris comes before the fall,” and finally Comcast has tripped on its own arrogance and contempt for the pubic and its customers, putting their monopolistic ambitions in the crosshairs finally. Stopping them is still dicey, but there’s real hope for serious scrutiny and the chance of victory. Comcast has a long corporate tradition of smiling and wearing beige no matter what kind of criticisms are hurled at it. That public posture is in keeping with the low-key approach favored by Brian L. Roberts, the company’s chief executive, as he seeks to take over the world. It’s worked very well so far. But in a filing submitted to the Federal Communications Commission last week in defense of its proposed merger with Time Warner Cable, the company lashed out uncharacteristically at its critics. And David L. Cohen, Comcast’s chief lobbyist, continued the salvo in comments to reporters and in his written remarks. Watching Comcast’s ballistic response to opponents of its $45 billion takeover bid was a bit like watching a campaign debate go off the rails. The front-runner, ahead by 20 points, is besieged by ankle-biters who suggest he is a lout and a bully. He finally loses it and goes off on his opponents in a fury, generally acting like, well, a bully. That’s one way to make a big lead go away. In baring its teeth, Comcast sought to show that the companies now opposing the deal were using public interest arguments to advance private business agendas. It said these companies had privately sought $5 billion in concessions from Comcast before going public with their opposition. Gee, Comcast, don’t sugarcoat it. Say what you really mean. The word extortion is usually applied to guys with names like Nicky who wear bad suits and crack their knuckles a lot. If this is how the company acts in the wooing stage, imagine how charming it will be once it actually gets what it wants. The company named names, plenty of them: Netflix, for complaining about interconnection plans it freely negotiated with Comcast; Discovery, for asking for sweetheart carriage deals before its current contract is even up; and Dish, for whining about enhanced competition. Its opponents were surprised by Comcast’s ferocity — and overjoyed. An air of inevitability has been hanging over the merger since it was announced in February — Comcast has a legion of allies in Washington, and a formidable advocate in Mr. Cohen — but the opposition that has built up in the ensuing months seems to have driven the company around the bend. Comcast executives are offended. They genuinely believe that it will take a company of its scale and growing technological innovation to deliver the next generation of programming and data services. Opponents of the merger are convinced that granting a beefed-up Comcast dominion over much of the country’s broadband would stifle innovation and tilt the field in unhealthy ways. Both sides believe they hold the key to a consumer-friendly, high-functioning Internet. What is actually going on is both more basic and more interesting. Programmers are worried that if Comcast takes over Time Warner Cable, it will have the leverage to dictate prices. Web-based services like Netflix foresee a giant that will extract significant fees for providing high-speed performance. Comcast, which agreed to all manner of regulation to complete its acquisition of NBCUniversal in 2011, does not want to hand out so many bonbons to other players that the proposed merger becomes noneconomic. There is no breakup fee on the deal and Comcast could still walk, especially if it feels that a merger would lead to the regulation of broadband access as if it were a public utility. 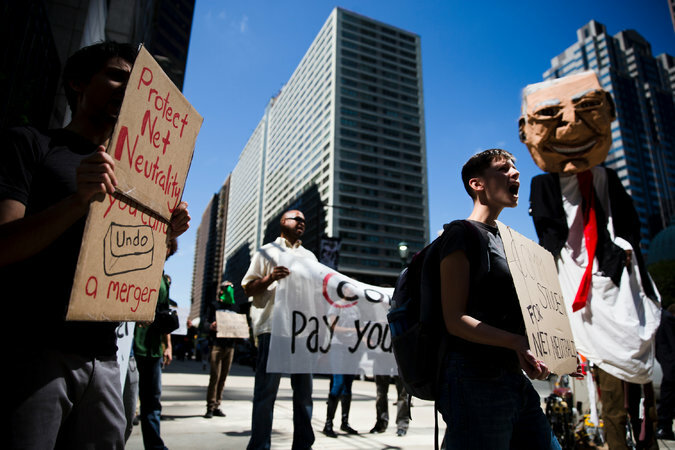 Opponents are trying to enlarge the merger debate to include the broader issues of net neutrality and monopoly control, and there are signs that these efforts are gaining traction in significant places. On Sept. 4, Tom Wheeler, the chairman of the F.C.C., surprised many, including Comcast, when he said in a speech that in terms of broadband that can support streaming on multiple devices, 82 percent of Americans have only one choice in providers. Regardless of motive, the issues raised in the filings are hugely important and won’t be brushed aside by bombast or counterattack. From the start, Comcast has sought to frame the debate more narrowly, portraying it as the merger of two cable operators that do not compete, which is sort of true and sort of beside the point. The future, as anyone with a router could tell you, is all about broadband; a merged Time Warner Cable and Comcast would control more than 35 percent of the broadband market with easy access to far more households and would be the dominant presence in 16 of the 20 largest cities in the country. Comcast is aggrieved that the people it has seen across the negotiating table — with their hands out — cocked a gun after they didn’t get what they wanted, but in terms of the public debate, Comcast is at a disadvantage. From the consumer perspective, Netflix provides a wide array of programming for $8 a month, and Discovery delivers abundant reality programming along with lots of furry and furious animals. Comcast is the cable guy with the drooping pants, the one who collects money for everyone else by issuing big, fat monthly bills — and then sends much of it right back out the door to programmers. A senior executive at Comcast agreed that its aggressive response was “uncharacteristic,” but said, “Enough was enough.” This executive spoke on the condition of anonymity to discuss internal strategy. It sounded sincere and very likely is, but going on the attack is probably not good strategy. Comcast has always combined its political might with restraint of tongue, a brutally effective combination that it has temporarily abandoned. In reminding the F.C.C. to scrutinize motives behind the arguments it will hear as it weighs whether to approve or challenge the deal, Comcast seemed defensive and frantic. I remain unconvinced that giving Comcast a bigger footprint is good public policy, but I understand its frustration. No one, even big, powerful companies, likes being ganged up on by opponents whose own motives are open to suspicion, but their response could create more problems than it’s worth. When I was young and stupid, my friends and I tried to cut through a yard full of turkeys just for the thrill of it. The turkeys surrounded us and immediately began hitting us with their wings, protesting the intrusion. My farm-raised pal cautioned me just to ignore it, but after a while I couldn’t stand it anymore and gave one a nice swift kick. And that’s when the trouble really started. This entry was posted in Citizen Wealth, Financial Justice, Ideas and Issues and tagged affordable internet, Comcast, digital divide by Wade. Bookmark the permalink.